The UAE is to establish the world’s first Sharia-compliant trade bank to bolster its ambition to be the centre of the Islamic economic world. 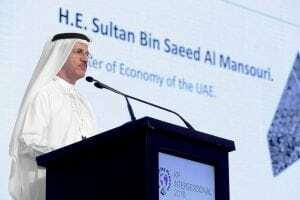 The Dubai Islamic Economy Development Centre (DIEDC), under the new chairmanship of Sultan bin Saeed Al Mansouri, the Minister of Economy, and the Department of Economic Development, are in “advanced discussions” with the Central Bank of the UAE to obtain approval for a wholesale Islamic banking licence for the new entity, to be called the Emirates Trade Bank. The talks are being led by a six-man committee appointed by Sheikh Hamdan bin Mohammed bin Rashid, Crown Prince of Dubai and chairman of the Executive Council. The committee’s chairman is Mohammed Al Gergawi, Minister of Cabinet Affairs and The Future. A statement from DIEDC said the new bank would specialise in international trade and commodity finance. “Emirates Trade Bank will be the first of its kind, a global Sharia-compliant bank exclusively offering integrated trade and international commodity financing solutions through leveraging and mobilising the infrastructure and logistics ecosystem of the UAE. “The bank will fulfil Dubai’s strategic goal of supporting the Islamic financial sector and integrating investments from this domain towards doubling UAE trade flows, which stood at about Dh1.4 trillion in 2014, by 2020,” it added. Sami Al Qamzi, the director general of Dubai Department of Economic Development and vice chairman of DIEDC, said: “The UAE in general and Dubai in particular are privileged to have a diversified, open and flexible economy capable of addressing international and regional challenges. Speaking on the sidelines of the Global Islamic Economy Summit in Dubai, Abdulla Al Awar, the DIEDC’s chief executive, said: “This is the first time such a bank – Sharia -compliant and focused on trade finance – has been envisaged. It can revolutionise trade in halal products and will complement the initiatives we have already launched on standardisation and harmonisation. The value of the global Islamic economy last year was recently put at US$1.9 trillion by the international information group Thomson Reuters. Global trade in halal food alone is expected to approach $2tn by 2020, it was estimated. Talks with the Central Bank are believed to be focused on how to capitalise the new bank. Equity participation from the private banking sector is one of the propositions being discussed. The statement said: “DIEDC will continue to support initiatives aimed at transforming Dubai into the capital of the Islamic economy. The other members of the committee are: Essa Kazim, the Governor of Dubai International Financial Centre and the secretary general of DIEDC; Hussain Al Qemzi, a board member of DIEDC and the chief executive of Noor Bank; Ahmed Al Janahi, the deputy chief executive of Noor Bank; and Saed Al Awadi, the chief executive of Dubai Export Development Corporation.